Blurb: Apron Bramhall has come unmoored. It’s 1985 and her mom has passed away, her evil stepmother is pregnant, and her best friend has traded her in for a newer model. Fortunately, she’s about to be saved by Jesus. Not that Jesus—the actor who plays him in Jesus Christ, Superstar. Apron is desperate to avoid the look-alike Mike (no one should look that much like Jesus unless they can perform a miracle or two), but suddenly he’s everywhere. Until one day, she’s stuck in church with him—of all places. And then something happens; Apron’s broken teenage heart blinks on for the first time since she’s been adrift. About the author: Jennifer Gooch Hummer has worked as a script analyst for various talent agencies and major film studios. Her short stories have been published in Miranda Magazine, Our Stories, Glimmertrain and Fish. She has continued graduate studies in the Writer’s Program at UCLA, where she was awarded the Kirkwood Prize in fiction. Currently, Jennifer lives in Southern California and Maine with her husband and their three daughters. This quote was from the opening pages of Girl Unmoored, the debut novel by Jennifer Gooch Hummer. From the beginning sentence I took notice. This character, a teen named Apron Bramhall, has an incredible voice which drew me in and kept me enthralled by her strong attitude and viewpoints. Apron is having a difficult time dealing with her mother's death, her best friend dropping her for someone better, and dad replacing her mom with a horrible soon-to-be stepmother. She is unmoored but during one summer she will begin to feel again, to love. This book is all about Apron's crazy, tragic, beautiful summer of 1985. For a young girl of thirteen, Apron is incredibly insightful. She will make you laugh out loud, she will make you cry, and she will most definitely make you believe in her. 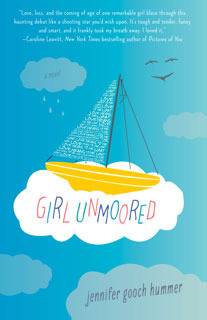 Poignant, candid, and heartbreakingly unique, Girl Unmoored is the best debut novel I've read in 2012. Thank you for such an amazing review. I wish I could put this last sentence on my book cover!